Here at ChiIL Live Shows and ChiIL Mama, Dave Grohl's long been one of our favorites. We're HUGE Nirvana fans and those songs are still in heavy rotation on our ipods. Grohl is versitile and crazy prolific, playing with a host of greats. Come check out Sound City, the documentary he produced and directed. It's playing THIS Tuesday at Chicago's hot venue for cool live shows and now films--City Winery!! ALL AGES. City Winery Chicago, 1200 W. Randolph Street, follows up the success of its April movie screening, 20 Feet From Stardom, with a special showing of Sound City, the acclaimed documentary directed and produced by Dave Grohl. The story of LA’s unsung analog recording studio in the Valley and the artists who made rock history there features appearances by Neil Young, Tom Petty, Stevie Nicks, Trent Reznor, Rick Rubin, Mick Fleetwood, Lars Ulrich, John Fogerty, Rick Springfield, Josh Homme, Frank Black, Pat Smear, Barry Manilow, Lindsey Buckingham, Lee Ving, Krist Novoselic and Paul McCartney. Sound City shows Tuesday, May 20, 8 p.m. in City Winery’s performance venue projected onto dual 90-inch screens and heard on City Winery’s state-of-the-art Meyer Sound® system. Tickets are $5, and guests receive 50% off carafes of City Winery house-made wines and $10 flatbreads. Deep in the San Fernando Valley, amidst rows of dilapidated warehouses, was rock ’n' roll's best-kept secret: Sound City. America's greatest unsung recording studio housed a one-of-a-kind console, and as its legend grew, seminal bands and artists such as Fleetwood Mac, Neil Young, Rick Springfield, Tom Petty, Metallica and Nirvana all came out to put magic to tape. 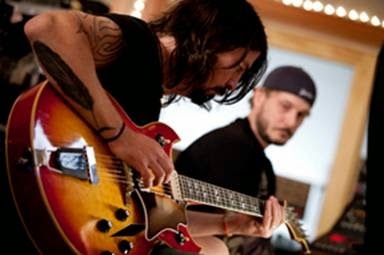 Directed by Dave Grohl (Nirvana, Foo Fighters) and featuring interviews and performances from the iconic musicians who recorded some of rock’s greatest albums at the studio, Sound City doesn’t just tell the story of this real-life rock ’n’ roll shrine; it celebrates the human element of music as Grohl gathers some of rock's biggest artists to collaborate on a new album. Using Sound City's legendary analog console, together these artists continue to create musical miracles in a digital world. All City Winery Chicago events are open to all ages and start at 8pm, unless noted. To purchase concert tickets or to become a City Winery VinoFile™ member, please call (312) 733-WINE (9463) or visit www.citywinery.com/chicago/. Sound City joins a diverse lineup of the most respected names in pop, rock, jazz, blues, world music and live lit performing at City Winery Chicago, including previously announced headliners and supporting acts: Spektral Quartet with Julien Labro (May 14); Colin Blunstone with special guest Edward Rogers (May 15); Cathy Richardson Band and Andrew Salgado (May 16); Steep Canyon Rangers (May 18); Sound City (May 20); Story Sessions (May 21); The Westies (May 22); Jackopierce and Phil Jacobson (May 23-24); French Quarter Fest with New Orleans Suspects, Jeffery Broussard & the Creole Cowboys and Sanctified Grumblers (May 26); Burton Cummings from The Guess Who (May 28-29); The Westies and Greg Trooper (May 30); Jukebox Groove (June 1, 2pm); Rising Appalachia and The Way Down Wanderers with Good Graeff (June 1); New Millennium Orchestra with Matt Ulery Trio (June 2); Josh Krajcik (June 3); Sizzling Latin Dance Night with Samuel Del Real and Juvenato (June 4); Bilal (June 5); Orbert Davis Sextet (June 8, 3pm); Chuck Prophet and the Mission Express – “Temple Beautiful with Strings” (June 8); Blitzen Trapper with Parkington Sisters (June 10); World Party with Gabriel Kelley (June 12-13); John Doe with Jesse Dayton (June 14); Carolina Chocolate Drops (June 16-17); Joe Purdy with Brian Wright (June 18-19); Ari Hest (June 20); Carrie Newcomer (June 22); Ginger Baker’s Jazz Confusion (June 23); Preservation Hall Jazz Band (June 24-25); Bruce Robison & Kelly Willis (June 28); Albert Cummings (June 29); Julian Lage and Nels Cline Duo (June 30); Berlin featuring Terri Nunn and Vapornet (July 1); The English Beat (July 2-3); Pedrito Martinez Group (July 4); Louis Prima Jr. & the Witnesses (July 6); Time For Three (July 7); Yarn with special guest Carolina Story (July 9); Dan Hicks and His Hot Licks (July 10); Dr. Ralph Stanley & his Clinch Mountain Boys with Town Mountain (July 11); Dengue Fever (July 12); Marc Cohn (July 17 - 18); Asleep at the Wheel (July 20); An Evening with David Crosby (July 21-22); and Dave Alvin + Phil Alvin with The Guilty Ones (July 24); Matthew Sweet ( July 25); The Bangles (July 27-28); Bruce Cockburn with Jenny Scheinman (Aug. 10-11); Sharon Shannon (Aug. 12). City Winery Chicago, a fully operational winery, restaurant with outdoor patio, concert hall and private event space, is located in the heart of the West Loop at 1200 W. Randolph, in the historic urban Fulton Market district. The concert hall accommodates up to 300 guests, all seated at tables with complete beverage and dining service, ensuring a comfortable “listening room” experience enhanced by a state-of-the-art Meyer Sound system. Riedel is the official and exclusive provider of glass ware, showing City Winery’s commitment to enjoying quality wine in a quality vessel. American Airlines is the Official Airline and Crowne Plaza is the Official Hotel of City Winery. For more information, please visit www.citywinery.com.